Media captionJeremy Corbyn: "I'm on the ballot paper"
Jeremy Corbyn will be automatically included on the ballot in Labour's leadership contest, the party's National Executive Committee has ruled. His opponents had said he needed the support of 51 MPs or MEPs to stand. His challenger, former shadow minister Angela Eagle, said she welcomed the contest and was "determined to win". The secret NEC vote went 18-14 in the Labour leader's favour following hours of talks. A Labour Party spokesman said: "The NEC has agreed that as the incumbent leader Jeremy Corbyn will go forward onto the ballot without requiring nominations from the Parliamentary Labour Party (PLP) and the European Parliamentary Labour Party (EPLP). Only those who joined Labour on or before 12 January will be able to vote in the leadership contest. Anyone who joined after then will have to pay an extra £25 to become a "registered supporter" - and will get a two-day window in which to do so. Speaking outside the meeting, Mr Corbyn told a crowd of journalists and supporters: "So I'm on the ballot paper... and we will be campaigning on all the things that matter. "That will strengthen our party in order to defeat this Tory government and bring in a government that cares for the people." He said he was sure Labour MPs "will understand that the party has to come together... to present to the British people the options of a different and better way of doing things". "I have been elected last year - ten months ago today - with a very large mandate," he said. "I respect that mandate, it's a responsibility I am carrying out." 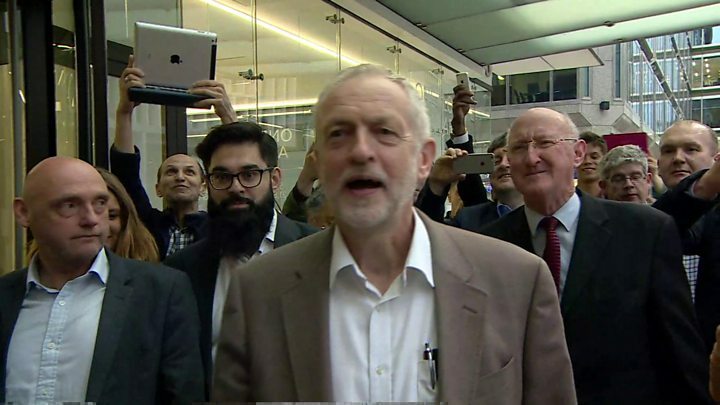 The Labour leader made a last-minute decision to attend the emergency meeting of the NEC in London. He had been due to address the Unite union conference in Brighton on Tuesday afternoon. Shadow chancellor John McDonnell, a key ally of Mr Corbyn, said on Twitter: "Jeremy on the ballot. Democracy prevails. We will use leadership election to sign up even more members and prepare ground for general election." And shadow secretary of state for defence Clive Lewis said the rules showed "quite clearly he should have been on the ballot" and said he would be supporting Mr Corbyn. But Lance Price, a former Labour director of communications, warned there was still the potential for the party to split. "I wouldn't say this is the death knell of the Labour Party - it's not - but it means we are entering very difficult dark days ahead," he said. The BBC's political editor Laura Kuenssberg said it was highly likely that the Labour Party itself would challenge the decision in the courts. Former shadow business secretary Ms Eagle - who has already secured 51 nominations from MPs - has been calling for Mr Corbyn to resign for days. She said she had eventually decided to launch a formal challenge because he was unwilling to stand down and she could provide the real leadership he could not. Reacting to the vote on Tuesday night, Ms Eagle said: "I'm glad the NEC has come to a conclusion. I welcome the contest ahead and I am determined to win it." Mr Corbyn was elected as leader overwhelmingly in a vote of Labour members and registered supporters last year. But following the EU referendum, he was hit by mass walkouts from the shadow cabinet and shadow ministerial positions in protest at his leadership. Labour's former work and pensions spokesman Owen Smith has said he would consider making a rival leadership challenge.